Munich - If ever a match epitomised the cliche of 'a game of two halves', it was FC Bayern München’s victory over 1. FSV Mainz 05 on Matchday 9. The record title-holders, though dominant in possession, were restricted to very few clear-cut openings in the first half against the Karnevalsverein, who went into the break a goal to the good courtesy of Shawn Parker’s 44th-minute strike. 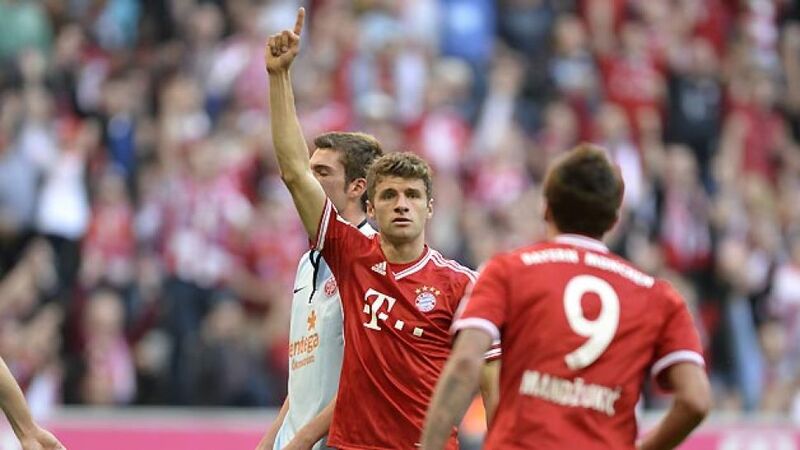 “We were unable to find the space we wanted to in the first half,” said Thomas Müller after the game. “Mainz were playing at their maximum, they were playing with five defenders and putting in a lot of effort.” It wasn’t only Mainz’s rearguard that made life tough for Pep Guardiola’s side, however: Even the attack-minded trio of Parker, Maxim Choupo-Moting and Nicolai Müller were retreating into their own half when Bayern were in possession. Something had to change: Guardiola moved Philipp Lahm and David Alaba, who had replaced the injured Dante minutes before the break, back to their familiar full-back positions and moved Schweinsteiger into the holding midfield role previously occupied by Lahm. It was the introduction of Mario Götze in place of Rafinha, however, that changed the course of the game. Götze then set up Bayern’s other Mario, Mandzukic, for Bayern’s third, before Müller wrapped up the points from the penalty spot after Schweinsteiger had been fouled. Guardiola will be delighted that his side managed to return to winning ways in the league after a week in which most of his players have been scattered across the globe on international duty. “Almost the whole of our squad was away with their national teams and it’s not always that easy when the weekend comes around,” Lahm admitted. “We have to get to grips with that as quickly as possible after the next international break.” Next up for Bayern, however, is Wednesday’s home clash with FC Viktoria Plzen and a chance to take a significant step towards qualification for the last 16 of the UEFA Champions League.